Ghana’s U-23 side, the Black Meteors survived an early scare today to beat the Panthers of Gabon by three goals to nothing. It took the brilliance of Inter Allies goalkeeper Kwame Baah to prevent the visitors from equalizing in the early minutes of the match before the home side scored four unanswered goals to win the match. Having started the match slowly, Coach Ibrahim Tanko’s men eventually crawled into the game and took control forcing their opponents to sit deep in their half. 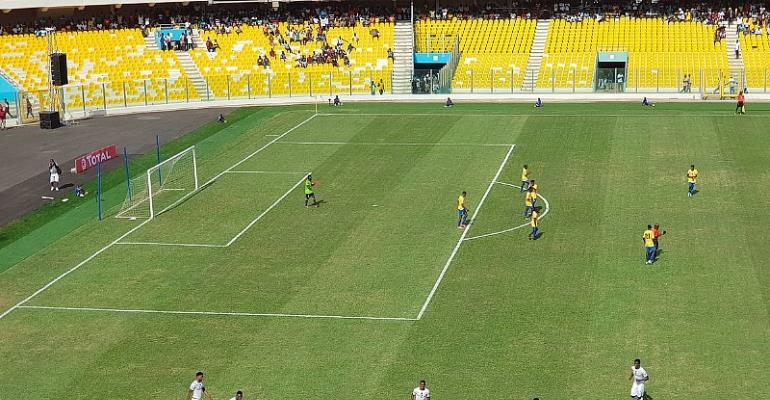 Their efforts were rewarded on the 14th minute when attacker Kwabena Owusu curled on into the top corner beyond the reach of the Gabon goalie. From there on, too much of individual play prevented the team from getting any additional goal in the first half as they were unable to create clear cut goal scoring opportunities. Just two minutes into the second half however, German based attacker Bernard Tekpetey who is currently on loan at Paderborn from Schalke 04 riffled one into the back of the net from outside the 18 yard box. With 15 minutes remaining till the end of proceedings, pacey midfielder Osman Bukari cemented the victory for Ghana by scoring a brace. The resounding victory means the Black Meteors have a huge advantage going into the second leg to qualify for this year’s u-23 AFCON which will be staged in Egypt this September. The second leg will be played in Gabon on Tuesday, 26th March 2019 at 14:30GMT. The team to qualify will face the winner of the two-legged tie between Equatorial Guinea and Algeria in the final round of the qualifiers. If Ghana is able to make it through to the U-23 AFCON, they will also have the chance of making it to the Tokyo 2020 Olympic Games.